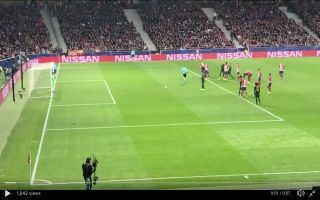 Monaco striker Radamel Falcao’s homecoming to Atletico Madrid certainly didn’t go to plan this evening with the Colombian missing a penalty in the 83rd minute of the tie. At 2-0 down Monaco were handed a late lifeline after Atletico defender Stefan Savic was sent off for a hand-ball in the box in the 82nd minute. Thierry Henry’s side had the chance to spark a late resurgence but Falcao failed to make the most of his opportunity and instead put his penalty wide. Falcao’s penalty was disastrous and the Colombian will be kicking himself tonight knowing that he could have led a late comeback against his former club if he stayed focused.